Writing for Research called this week for ‘all academic books to go digital’. While I admit to some book fetishism (as described in the post) nonetheless I agree with this sentiment. At the heart of this issue, as I see it, is accessibility – a crucial part of education. In addition to the importance of open access to books as a means of disseminating research, this post considers the meaning of open access and the potential it offers for journal articles too. Online (computer-mediated) discussions seem to be increasingly adopted for learning interactions in legal education. The form and structure of these discussions vary widely, depending on the technology and the context adopted. The discussions can be synchronous or asynchronous, appear in relatively simple bulletin board style formats, or be embedded as part of more complex simulations. Synchronous discussions can provide “real time” flow, whereas asynchronous discussions provide flexibility for participants working in different time zones, or to different timeframes. Social media offers learners a way of taking online discussions out of institutionally-based proprietary systems, and some legal educators use platforms like Twitter, Facebook, and blogs, for online discussions. Most online discussions have in common the capacity to overcome distance between participants. Aside from flexibility, and assuming access to the necessary technology, this quality can improve equity and parity of access to participants who might not otherwise be able to participate in a learning event, e.g. rural or regional learners, or hearing-impaired learners. It seems to me that some institutions perceive online discussions as a way of saving costs. I believe that this is not necessarily so, when taking into account learner satisfaction, and achievement of learning outcomes. It is true that some online discussions seem to fire up of their own accord, and this is great when it happens. On the other hand, where online discussions are used regularly and consistently as a medium for teaching and learning, and given the variability of social interactions, appropriate preparation before using online discussions is advisable. Here, I provide 10 tips drawn from my work in online discussions, and my masters research completed in 2011. * I have not included references, but citations are included in the article linked below. 1: It does not matter what platform or software you use for online discussions, provided that it is robust, safe, and easy for your learners to access and use. My research suggests that “bells and whistles” are not particularly valued by learners, and are distracting. In my experience, proprietary systems custom-built for institutions tend not to do as well as freely available platforms, familiar to most learners these days. 2: Learner motivation and engagement can depend on many things. The fundamentals are: learners can see the activity as important and relevant to their learning; and learners can see they have resources they need to undertake the activity. Plain language guidance about these, before beginning the activity, is essential. “Cognitive Presence”: learners’ participation made visible through engagement with questions and peers, reflective statements, discussions, and peer-to-peer feedback. “Social Presence”: learners’ projection of their personal, social, and affective characteristics, in ways appropriate to the context. “Teaching Presence”: made visible through the design and organisation of the activity, facilitation of the discussion, direct instruction (also timely stepping in to clear up errors or ambiguities), and linking insights to learning outcomes. 4: In my research, I found that learners value peer-to-peer discussions very highly, and are dissatisfied if they do not receive individual feedback from their peers, in addition to the teacher’s feedback. 5: Whilst learners highly value peer-to-peer interactions, they also value the teacher’s timely interjections when the group is struggling with something. 6: Learners expect to receive from the teacher, individual, relevant, and timely feedback. Learn about those who are in the group. Knowing about learners’ past experiences with discussions can be informative. 7: That said, learners are dissatisfied if the teacher dominates the discussion. So teachers need to get a sense of when to hold back, and give the learners a chance to develop their sense of community. 8: Like a good dinner party, learn when to clear the table, and bring out the next course (instructions, interjections, discussion topics, activities). 9: Assessment – this can motivate engagement, but is also a recipe for superficial participation, and group dissatisfaction. If you intend to grade participation in discussions, be very clear about how this is done, and if possible supply a rubric as a point of reference. 10: A light touch – sparingly feed in relevant and current materials, like blog posts and streaming videos – be clear about whether extrinsic material speaks to the learning objectives, and furthers understanding. Many legal educators used LinkedIn, but several have told me they don’t see the point. There is a fair bit written about using Twitter and blogs in higher education, and in legal education. Less visible however is the easy-to use microblogging/social media hybrid, Tumblr. The question is, can Tumblr be used in an educational context? The answer is, yes it can – but its form means that it may not appeal to purists seeking an in-depth doctrinal analysis of complex areas of law. Post text, photos, quotes, links, music and videos from your browser, phone, desktop, e-mail or wherever you happen to be. You can customize everything, from colors to your theme’s HTML. To use Tumblr, you subscribe to accounts and you can view posts – often audio/visual, though also textual – as you scroll vertically through your feed. In this respect, the experience is somewhat like Twitter. The interactive part occurs via a ‘like’ or comment on a post, somewhat like Facebook. Accounts also have the option of ‘ask me anything’, inviting question and answer. These interactions then show up on the post, and will be viewable in the feed of all who subscribe to that account. Additionally, once you have an account, you can upload simply and easily from your smartphone, computer or other device. You can upload thoughts (via text), images, videos, audio, web links…or combinations of these, according to your interests. Many posts use hashtags to represent key words, and these can be searched to find new accounts to follow, or to follow a ‘trending’ event. The Criminal Lawyer provides an ‘illustrated guide to criminal law’ and even answers (non-specific) questions about the criminal law. Again, it makes the most of the variety of media that can be uploaded onto Tumblr. For a text-based Australian law account, take a look at Shitjudgessay. This pithy account captures brief quotes from Australian case law. Without necessarily proclaiming the ratio or important obiter from leading cases, it encapsulates ‘the vibe’ of the courtroom and the literate foundation of the law through its selections. It provides the student of law with a view of the law at odds with the all-too-serious approach of the law school curriculum. My last example illustrates how a lecturer can use Tumblr as a medium of communication with students and other viewers. At Freedom to Dixer, legal academic Peter Black invites questions from readers. Some of these relate to his course administration and others are more personal. Either way, this account represents the way in which social media lies at the intersection of the somehow within and beyond the professional. It is an effective use of a social media tool to engage and communicate with students. Because of the infinite ways in which the user can tailor Tumblr to their own interests, it can be used by the academic in a number of ways. 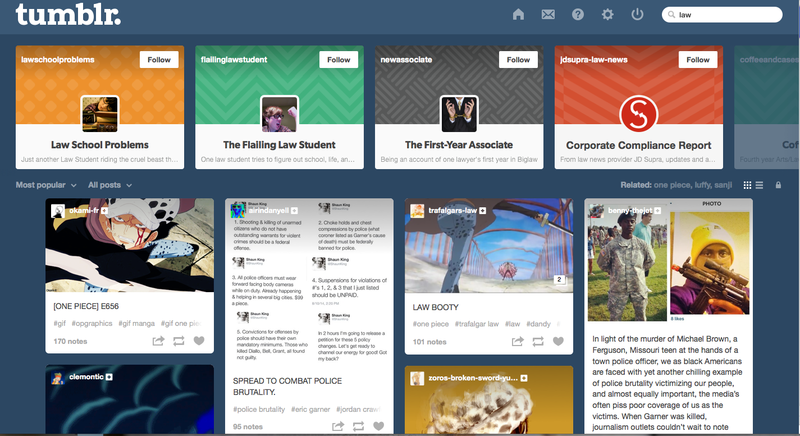 Dissemination of information to support a course, links to current events, question and answer and diverse ‘artifacts’ to represent a path of thought about the law, Tumblr can do it all. For the course designer however, it’s important to remember that this is a tool designed by the user. So giving over control to the viewer is part of the challenge. I suspect that Tumblr can also be used as a tool for students to capture (and post) their own thoughts and impressions of the law – but I’m not aware of how academics are presently using it deliberately as part of course design. Do you have any ideas? Julia E Rodriguez, ‘Social media use in higher education: Key areas to consider for educators‘ (2011). Gráinne Conole and Panagiota Alevizou, ‘A literature review of the use of Web 2.0 tools in Higher Education‘ (2010) A report commissioned by the Higher Education Academy. Lenore Georgina Adeline Hamilton, ‘Social Media and the Tyranny of Distance-Pacific Access to Legal Information‘ (2013) 1(1) Journal of Open Access to Law. Liesel Spencer and Elen Seymour, ‘Reading Law: Motivating Digital Natives to ‘Do the Reading’’ http://papers.ssrn.com/sol3/papers.cfm?abstract_id=2473448. In an earlier post, I described using Twitter and Storify as a digital repository for events. I am especially thinking about the lack of a repository for legal education conferences in Australia. What happens to all the presentations after the event? I didn’t see any process to capture slides & papers and organise this on the ALTA site. As I argued in my keynote the archiving of papers, presentations, projects and much else is essential to the memory of the discipline, in which regulators should be taking a leading role; but until that happens, professional bodies such as ALTA need to do that for the academic profession, and a good place to start would be with the annual conference. I agree. As someone researching practical legal training practitioners’ engagement with scholarship of teaching and learning, I have encountered huge gaps in archived material for professional legal education in Australia. There seems to be no central repository for materials presented at the Australasian Professional Legal Education Council (APLEC) annual conferences either. A key concept in scholarship of teaching and learning is sharing work, to extend knowledge, and for critical scrutiny. I contend a good repository will further this work. It is true that some (not all) conference papers become available through publication in scholarly journals, in time. Some presenters take time to share presentations via their personal blogs, or on sites such as Academic.edu, ResearchGate, and SSRN. There seems to be no centralised “event” repository, however. Further, it is possible to conceptualise legal education scholarship as a ‘multi-dimensional’ body of activities (Trigwell et al, 2000). Those dimensions include “information”, “reflection”, “communication”, and the “conceptual”. Publication in scholarly journals is a fragment within those dimensions. In the context of social media in legal education, we see new modes of communication, new ways of working with information, and new platforms for reflection in action. All of which further problematise ways we conceptualise teaching and learning. So a centralised event repository should ideally have the capacity to encompass all of these, be robust, and be easy to set up and use. I think there are many possible solutions, but here I will suggest one example. Over the last few days I have trialled figshare. It took just a few minutes to set up the account. It takes longer to upload the materials, but figshare supply a desktop uploader, which allows batched uploads. Uploaded materials can be classified, eg, “presentation”, “paper”, “dataset”, etc. Each item can be tagged, eg, “online forums”, “community of inquiry”, “professional responsibility”, to produce metadata. Best of all, each item is given a digital object identifier (DOI), which means it is easy to cite, and to track using altmetrics. It would be possible to include datasets and data visualisations from social media outputs connected to the event. This seems to me to be a simple durable way to set up a digital repository for legal education conferences and other events. It seems that figshare contemplates the use of institutional accounts for data management, data dissemination, and reporting. Perhaps each conference could have its own repository, or perhaps organisations such as ALTA and APLEC could set up institutional accounts? I’ve used figshare as an example, but there might be other appropriate resources. To have a durable, searchable, trackable, centralised, taggable, digital repository for all dimensions of legal education scholarship would be an excellent resource. Kate Galloway, in her recent series of posts on legal education in a digital context, invited us all to take some step to try something, anything, to digitally enhance our legal teaching practice, whether we were at entry level, consolidation or mastery of our skills. We always talk about getting away from reliance on powerpoint slides, so I decided to try Powtoon, a free animated video editing site, that allows you to make short presentations that can be accessed online by everybody. You can also upload the link they give you to a you-tube channel, embed it in your learning management platform, or into your presentation slides. Melissa’s Powtoon on Social Media for Law Students. I found the ‘drag and drop’ process quicker and easier than Prezi, and much more fun than powerpoint; the end product, the videos, are engaging. It could be used by law lecturers for introducing a topic, for conveying the relationship between parties or facts of cases, or for student presentations. It would be suitable for ‘flipped’ learning. What do you think of Powtoon? Have you used any alternatives to prezi or powerpoint recently? I would love your feedback via comments below. Melissa Castan teaches law at Monash University, and maintains the Amicae Curiae Blog. She tweets as @MsCastan.